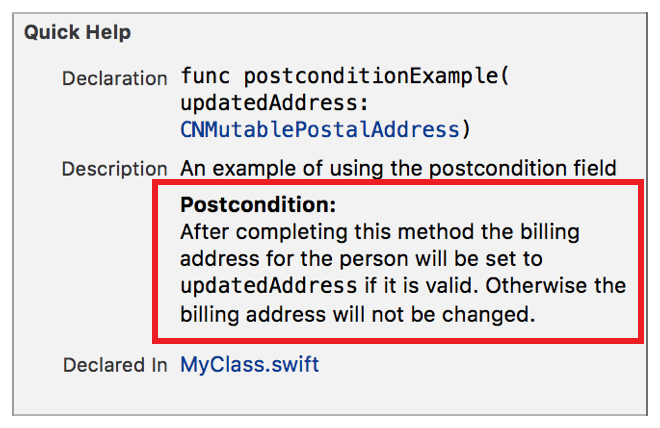 Add a Postcondition callout to the Quick Help for a symbol using the Postcondition delimiter. Multiple Postcondition callouts appear in the description section in the same order as they do in the markup. Use the callout to document conditions which have guaranteed values upon completion of the execution of the symbol. The description displayed in Quick Help postcondition for the callout is created as described in Parameters Section. the person will be set to `updatedAddress` if it is valid. Otherwise the billing address will not be changed.